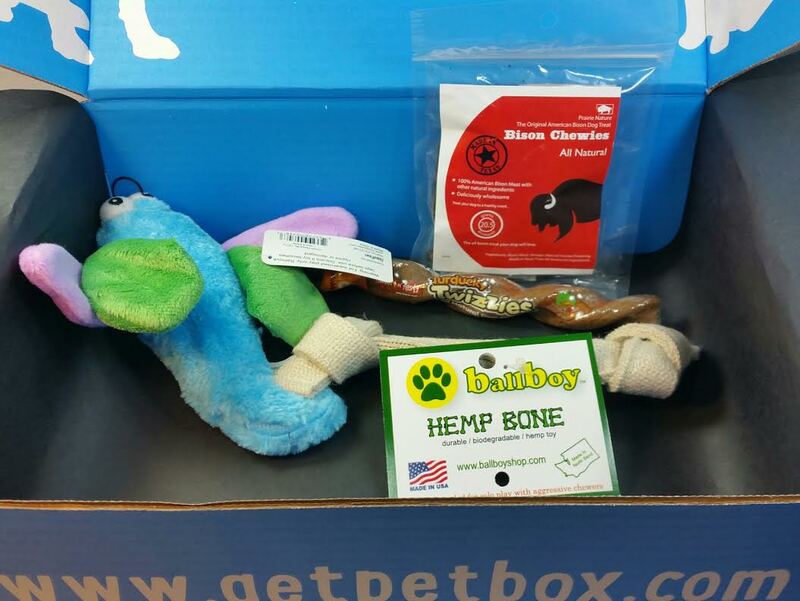 This is the February 2015 Petbox even though it's March. They tend to ship pretty late in the month but I did get this yesterday when it was technically still February so good on them for shipping it earlier than normal for me! Petbox sends out subscription boxes for, not just dogs, but cats as well. They even have a subscription for households with both cats and dogs so you're pretty much covered no matter what kind of animal you have. You can see the list of their subscriptions here. The Cost: So this is a tricky one for me. Technically, this box is $29.99 but they don't have this option on their website. That's because it was purchased on Gilt City. You can also buy this type on Groupon from time to time. They call it a Deal Box. Ballboy Hemp Bone- Umm... did you see the price on this thing? This toy boasts 3 layers of 100% hemp webbing is hand knotted at the ends creating knots and tabs at the end of the "bone". Oddly enough it's made about 15 miles away from me! Dexter is currently in his bed guarding this, gnawing at the ends. I'm excited to see how well this hold up. For that price it better last forever! 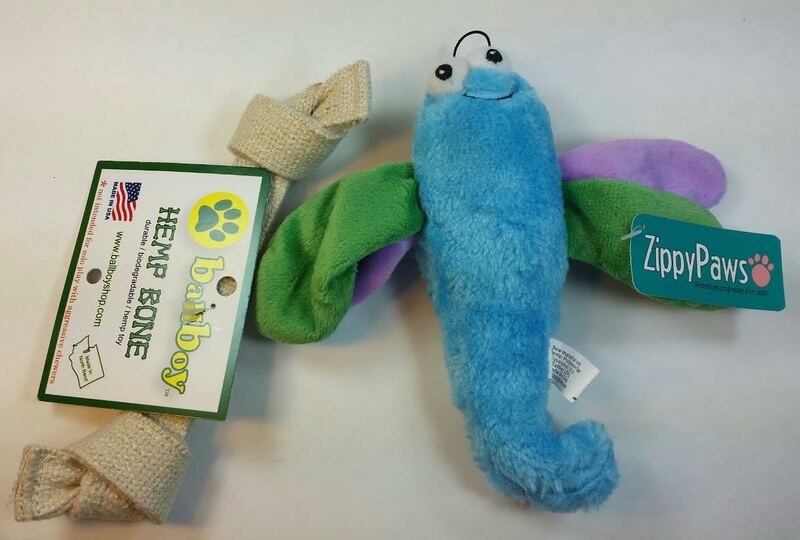 ZippyPaws Crinkle Dragonfly- What's not to love? Bugsy is squeaking and crinkly away with this toy as I'm writing this. I kind of want to take it away because of the squeaking but he is so happy I just can't do it. 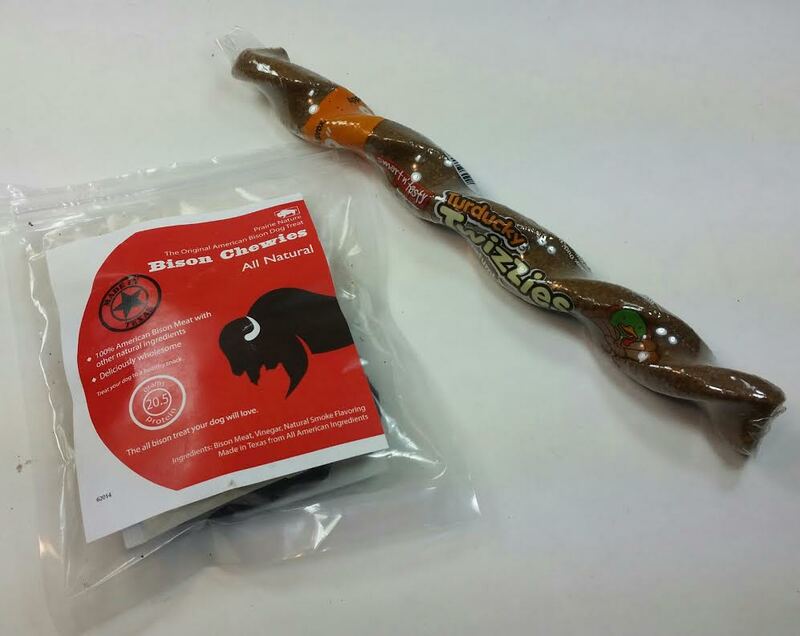 Prairie Nature Bison Chewies-2oz- This is 100% American Bison meat. There are no grains, soy or any other filler and no salt, chemical preservatives,hormones or anything else. This is a 2oz bag and it's ridiculously expensive. I haven't experimented much with bison so I'm interested to see how well these go over with the boys. Emerald Pet Turducky Twizzle (9")- Now this is something both dogs will want. I'm going to try to cut it in half so they can each have a piece. I'm not sure I can do it. This treat is made in the USA and has only 6 ingredients. Woohoo! VERDICT: I'm going to be honest. When I saw the contents of my Petbox I was not happy. These things were sliding around in the big box and I thought for sure something was missing. Then I started writing up the review and realized that good things can be small and come in huge boxes. Not only that, Dexter loves the hemp bone. He doesn't play much with toys but he does like chewing bones. I was so thrilled when I held this out to him and he grabbed it and ran to his bed. This box has a value of $37. I do need remind you that I bought a $29.99 version that is not available for purchase on the website. This is one step down from the Premium box and one step up from the Deluxe. This review should give you an idea of what you can receive in either box (with either one less or two more products included). For the price I paid using a voucher, this box is a very good deal for me. I don't think they have the highest quality toys or the most varied brands but they try pretty hard and they're getting better at what they're doing. My boxes have improved, I think. If you'd like to sign up for Petbox, you can do that right here. Use NALA to get 10% off your subscription!